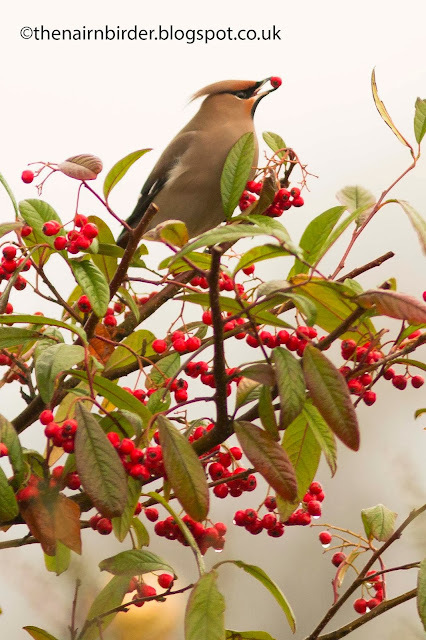 The Nairn Birder: Waxwings - already! Yet again it's been ages since I posted. Most folk have stopped bothering to visit the blog.....well, here's hoping some have you have hung in there! I take the time to take get some of my pics back onto the blog so I can talk about the birds. Back in April I posted to say that the Waxwings are still hanging around the area. Well, the last I saw and heard of them was in the 2nd week of May - and now they're back already! They were spotted in Elgin earlier this month, and they are now being seen there every day - so keep a look out for them and please let me know if you see them, if you can. Here's one I captured on camera on a tree at the 1st Tee of the Dunbar on New Year's Eve. It's been on the blog before, but it's worth looking at again because they are lovely birds and a real treat if you get them in your garden. 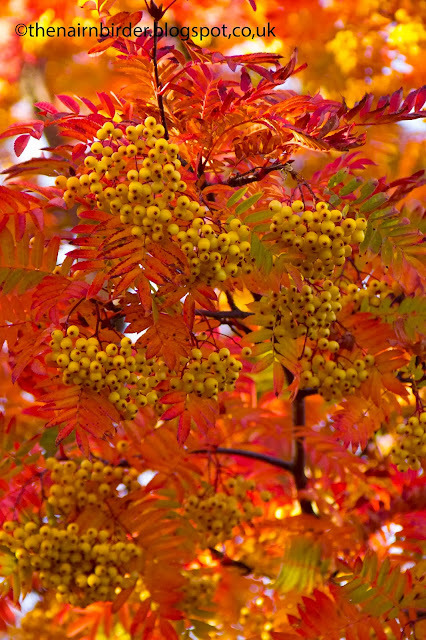 You're very likely to see them on any tree / bush boasting lots of berries, such as the Rowen Trees below. Some of you will already have had your trees stripped by the Thrushes - including the Redwings and Fieldfares that winter with us in Nairn. Waxwings also love rotting apples left on the grass, or stuck on the end of a stick for them to perch on. I've even known of them eating apples from your hand! That is a real classic Seamus ! Thanks very much! Here's hoping we get a chance to see these birds down on the river.